Start-up guide to the Internet, with links and much more. Welcome to the the home page of the Society for Women in Philosophy. This page receives roughly 1000 requests per week. The Society for Women in Philosophy was started in 1972 to promote and support women in philosophy. 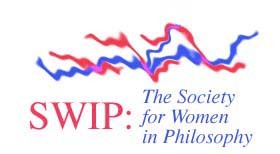 SWIP holds divisional meetings, meetings in conjunction with the meetings of the American Philosophical Association, and it publishes newsletters. NOTE: This page is maintained on a purely voluntary basis by Dr. Cynthia Freeland. She cannot always respond immediately to your queries or suggestions, but will try to do so eventually. If you would like to volunteer to maintain some related pages (we could use pages to cover calls for papers or job listings), please write to let her know and she will be happy to share the load. Send queries or suggestions to CFreeland@UH.EDU. New! Why are Women only 21% of Philosophy? Additional course syllabi for Feminist Theory, etc. courses. Check them out, and/or send in your own! Interested in joining SWIP? You must join a division. See the column at the top left titled "Divisions and Newsletter." Information may be found by following that link. Are you from an organization wishing to purchase our mailing list? Please write to the Newsletter Editor, Chris Cuomo. Note that you can only be listed on our mailing list if you are a MEMBER of SWIP and if your DUES ARE CURRENTLY PAID. Please do not request to be on the list otherwise, because it we wish to maintain an accurate and up-to-date list of our actual members. Women in Philosophy, a discussion on Wikipedia of the difficulty of ascertaining the exact percentages of women in philosophy.